Double aortic arch is an abnormal formation of aorta, in which two aortic arches was formed instead of one. These aortic arches may form a vascular ring which can compress the trachea and oesophagus. This condition is associated with heart defects such as ventricular septal defect (VSD).1 As the vascular ring leads to narrowing and stenosis of the airway, cardiac surgery on such patient poses a challenge to the anaesthetists. Induction of anaesthesia put the patient at risk of complete airway obstruction and trauma caused by severe narrowing of the trachea. Intraoperatively, there are risk of massive haemorrhage and complications from cardiopulmonary bypass. In addition, weaning from mechanical ventilation may be difficult due to tracheomalacia or tracheal stenosis.2,3 Failure of extubation, severe respiratory distress after surgery and prolonged ventilation requiring tracheostomy have been reported.4,5 We report our experience of anaesthetic management during cardiac surgery for an infant with a double aortic arch and underlying heart failure. Postoperative weaning was facilitated by a modified nasopharyngeal continuous positive airway pressure (CPAP) device. A six-month old girl presented to us in heart failure. She was found to have large perimembranous ventricular septal defect (PMVSD) three months ago. She had been admitted since then, and suffered from uncontrolled heart failure as well as pulmonary hypertension despite receiving multiple anti-failure medications. She was noticed to have persistent stridor. However, airway study was unable to be conducted because the patient was unfit due to the recurrent episodes of heart failure. She was scheduled for pulmonary artery banding and double aortic arch repair through left thoracotomy. In the operating theatre, gas induction of general anaesthesia with sevoflurane 1-3% was performed, under fractional inspired oxygen (FiO2) of 50%. SpO2 was maintained near the baseline of 92% to avoid the deleterious effect of over-circulated lung perfusion due to exaggerated left to right shunt and pulmonary congestion. After mask ventilation was confirmed to be adequate, a 3.5 mm internal diameter uncuffed endotracheal tube (ETT) (SoftVent® Pro, HVLP-Cuff, Murphy, Unomedical, Malaysia) was inserted and anchored at 9.5 cm without bypassing the narrowest part of the trachea. The ETT was placed with the designated black mark located at the level of vocal cords. Mechanical ventilation was adequate for both lungs by the evidence of adequate tidal volume (6-8 ml/kg), peak airway pressure of 20 cm H2O, equal and clear lung fields on auscultation, as well as an adequate oxygen saturation. Arterial blood gas showed pH 7.5, pCO2 30 mmHg (4.0 kPa), pO2 249 mmHg (33.2 kPa), HCO3- 29 mmol/L and BE of 5 mEq. The ETT was not advanced beyond the tracheal stenosis area to reduce the risk of bronchospasm as well as trauma to the airway and the surrounding major vessels. Intravenous (IV) rocuronium 0.6 mg/kg was administered just before the start of thoracotomy. Anaesthesia was maintained with sevoflurane 2-3% and FiO2 of 50%. Surgery was uneventful and she was put on adrenaline 0.1 mcg/kg/min, dobutamine 10 mcg/kg/min upon completion. After the surgery, the patient was admitted to intensive care unit (ICU) for close monitoring. Ventilation was maintained at a higher positive end expiratory pressure (PEEP) of 12 cmH2O via CPAP with the pressure support (Ps) of 4 cmH2O above PEEP. She received continuous morphine infusion 10 mcg/kg/hour as analgesic which was tapered down slowly. On the third postoperative day, she was extubated to a modified nasopharyngeal CPAP device, and pressure support was slowly tapered down. Five days later, she was successfully weaned off from the non-invasive ventilation and was discharged back to ward. She had occasional stridor. However it improved subsequently and she was able to be discharged home well. 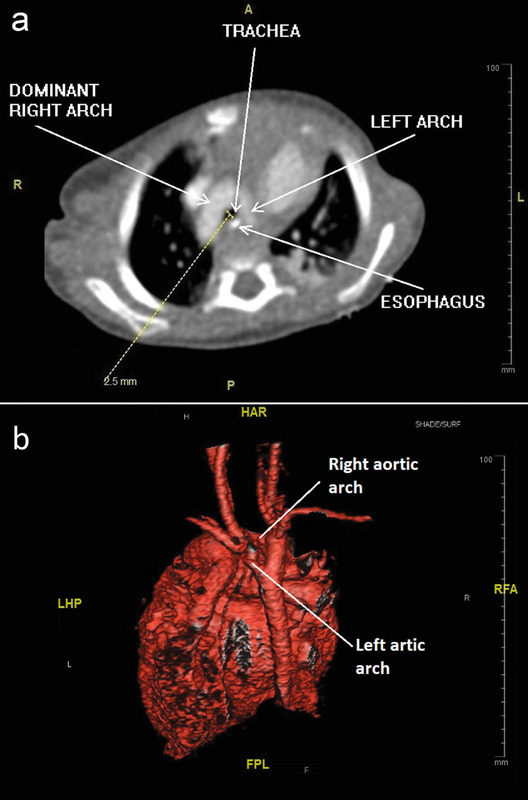 Figure 1 (a) Vascular ring formed by double aortic arch, caused a narrowing of airway up to as small as 2.5 mm in diameter; (b) 3-Dimentional reconstructed CTA showed vascular ring formed by double aortic arch. CTA, computed tomography angiography. Difficulty with ventilation has been reported in a case of undiagnosed vascular ring during ventriculo-peritoneal (VP) shunt surgery.3 In that particular case, difficulty in ventilation was encountered after patient was paralysed with muscle relaxant, and fiberotic bronchoscopy revealed a tracheomalacia. Adequate ventilation was achieved only when the tip of the ETT was pushed in between the stenotic part and the carina. The recommended technique of intubating a patient with vascular ring is by preoperative or intraoperative bronchoscopy.9 This is because a bronchoscopic evaluation is accurate to assess proper endotracheal tube position. However, in our patient who was suffering from recurrent chronic heart failure and pulmonary hypertension, forcing the ETT through the stenotic site may pose a risk of overstimulating the airway leading to complications such as bronchospasm or even trauma and bleeding. Therefore, we opted for gentle handling of the airway. In the present case, muscle relaxant was not given during induction and intubation. It was given much later i.e. just before skin incision of the thoracotomy. If ventilation problem encounters, the plan was to push in the ETT gently down towards the carina, or may consider a rescue dose of sugammadex. In case airway obstruction does not improve with the above method, measures including endobronchial intubation by surgeon after thoracotomy or immediate release of compression had been considered. Using an FiO2 of 0.5 during the induction of anaesthesia, intubation without rocuronium and the placement of ETT above trachea stenosis site may have a potential to make the patient deteriorate. However, we opted for more physiologically friendly methods custom tailored to the patient after considering the risk and benefits. The strategy had nicely worked and the patient turned out well. A vascular ring may also cause tracheomalacia leading to prolonged ventilation post-surgery.5 Prolonged tracheal intubation may increase the risk of subglottic stenosis and ventilated associated pneumonia. Therefore, vigilant and careful management is necessary during the postoperative period. In view of presence of tracheomalacia due to the longstanding vascular ring, we maintained a higher PEEP via CPAP during the immediate postoperative period, then extubated the patient to a modified nasopharyngeal CPAP device (Figure 2a). There are several ways of delivering CPAP non-invasively, including the use of nasopharyngeal prongs or nasal masks.10 However, securing the nasal prongs in place is a problem as the child tends to move about. We therefore modified the ETT by shortening it, inserting the tip into the nasopharynx, turning it into a nasopharyngeal CPAP device (Figure 2b). This had helped to maintain a patent airway for weaning after extubation. To the best of our knowledge, there has been no report describing in detail about such technique. In conclusion, the main anaesthetic strategy in this complicated case was to prevent life-threatening events caused by the difficult management of the airway, heart problem as well as difficulty in weaning off ventilatory support. A modified nasopharyngeal CPAP with shortened ETT may also be researched in future studies to improve the effectiveness of non-invasive ventilation. Figure 2 (a) Modified nasopharyngeal CPAP ensures a more secured CPAP; (b) Shortened Endotracheal tube functioning as modified nasopharyngeal CPAP. CPAP: continuous positive airway pressure. We sincerely thank the team from Healing Little Hearts Foundation which is based in United Kingdom to provide paediatric cardiothoracic services as a charity programme in Hospital Universiti Sains Malaysia (HUSM), Malaysia. We would also like to thank Dr. Mohd Rizal Mohd Zain for his excellent care to the patient before and after the surgery, Dr. Jo Anne Lim and Mdm Lee Jong Koh for critical reading and useful comments on this manuscript. 1. Alsenaidi K, Gurofsky R, Karamlou T, Williams WG, McCrindle BW. Management and outcomes of double aortic arch in 81 patients. Pediatrics 2006;118(5):e1336-41. 2. Anand R, Dooley KJ, Williams WH, Vincent RN. Follow-up of surgical correction of vascular anomalies causing tracheobronchial compression. Pediatr Cardiol 1994;15:58-61. 3. Mizushima A, Sakai H, Hanzawa K, Horimoto Y. [Unexpected intraoperative respiratory distress; an infant who developed tracheomalacia and fatal aortoesophageal fistula due to unrecognized vascular ring]. Masui 1995;44:1000-4. 4. Ruzmetov M, Vijay P, Rodefeld MD, Turrentine MW, Brown JW. Follow-up of surgical correction of aortic arch anomalies causing tracheoesophageal compression: a 38-year single institution experience. J Pediatr Surg 2009;44:1328-32. 5. Reah G, Entress A. Prolonged tracheal intubation in an infant with tracheomalacia secondary to a vascular ring. A useful adjunct to treatment? Anaesthesia 1995;50:341-2. 6. Enriquez G, Cadavid L, Garcés-Iñigo E, et al.Tracheobronchomegaly following intrauterine tracheal occlusion for congenital diaphragmatic hernia. Pediatr Radiol 2012;42:916-22. 7. Zheng G, Wu X, Tang L. Respiratory Symptoms due to Vascular Ring in Children. HK J Paediatr (new series) 2016;21:36-8. 8. McLaren CA, Elliott MJ, Roebuck DJ. Vascular compression of the airway in children. Paediatr Respir Rev 2008;9:85-94. 9. Backer CL, Mavroudis C, Rigsby CK, Holinger LD. Trends in vascular ring surgery. J Thorac Cardiovasc Surg 2005;129:1339-47. 10. Ahluwalia JS, White DK, Morley CJ. Infant Flow Driver or single prong nasal continuous positive airway pressure: short-term physiological effects. Acta Paediatr 1998;87:325-7.